Greetings of the New Year from Marta as tu Mika-Mysliwy, Parhelium Herald! Atenveldt Letter of Intent: Just for the record, there was no December 2005 Atenveldt Letter of Intent. Those submissions intended for a December LoI appear in the January 2006 LoI. Heraldry Hut: The next Heraldry Hut will be Friday, 20 January, beginning at 7:30 PM. Letter of Acceptance and Returns: The Atenveldt submissions found in the September 2005 LoAR (those in the May 2005 Atenveldt Letter of Intent) and the October 2005 LoAR (June 2005 Atenveldt LoI submissions) are included at the end of this report. Azure, a pale raguly argent between a pair of wings Or. ( http://www.sca.org/heraldry/paul/ ). Ivoninskoi is a locative byname dated to c. 1492 in “Locative Bynames in Medieval Russia,” Lord Paul Wickenden of Thanet ( http://www.sca.org/heraldry/laurel/names/toprus.html ). The client will not accept major changes to the name, and while this seems correctly formed, she has also marked that the desired gender of the name is female, and this is a masculine name. Russian isn’t a Romance language, so a terminal -a doesn’t necessarily suggest a feminine name; could her local herald see if she’s “okay” with this name, particularly if she likes the sound of it? (I think a feminine form would be more likely Ivoninskaia – there doesn’t seem to be a feminine version of Marusha so she’d have to choose a fairly different-sounding name). Amy Marie MacCormack (Twin Moons): NEW DEVICE CHANGE: Per chevron inverted vert and purpure, a chevron inverted embattled and in base a spaniel statant Or. Annalies Katerina Schneider (Atenveldt): NEW DEVICE: Per pale azure and argent, a tree blasted and eradicated and a chief dovetailed, all counterchanged. Aron von Reichenstein (Tir Ysgithr): NEW NAME and DEVICE: Per pale azure and gules, a griffin Or between three Maltese crosses argent. Edward de Foxton (Atenveldt): NEW NAME and DEVICE: Per bend sinister vert and purpure, a bend sinister argent cotised with chains throughout Or between a sword inverted surmounted by two swords in saltire and a fox rampant contourny argent. (fieldless) A claymore inverted proper, the blade surmounted by a tower sable. The original submission, with a tower argent, was returned because most commenters thought this had a high likelihood of return with the argent tower on the argent portion of the sword (from any distance, there would be a question of whether the blade was surmounting the tower, or the tower was surmounting the sword. Changing the tincture of the tower has solved this problem. Hrefna Gandalfsdottir (Brymstone): NEW DEVICE: Per saltire vert and argent, a raven close sable. Mary Rose de Burgon (Atenveldt): DEVICE RESUBMISSION from Laurel, October 2002: Argent, two peacock feathers crossed in saltire proper and a chief vert. 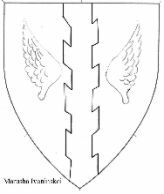 Romanos Koresses (Atenveldt): NEW NAME and DEVICE: Or, a Latin cross flory azure charged with a cross argent. The original device submission, Gules, a natural leopard dormant contourney proper and a bordure wavy pean., was returned for the beast being in an unidentifiable posture and for violating tincture, with the pean bordure on the gules field. Name RETURNED for undocumented element, possible submission fee; Device RETURNED for multiple conflicts. Cailleach Colquhoun (Atenveldt): NEW NAME and DEVICE: Argent, a dragon sejant affronty and on a base gules a heart argent. Name RETURNED; Device HELD for acceptable name. Elaria filia Robert: NEW DEVICE: Vert, a leaf and a tierce Or. Name RETURNED for non-period pattern of household name construction. Katharina von Marburg: NEW DEVICE: Gules, on a bend sable, three griffins segreant palewise Or. Device RETURNED for tincture violation. Romanus Rodrigo: NEW DEVICE: Azure, a double-bladed axe and in chief three suns above a bar argent. Submitted as Ailleann Mac Quinn, the documentation for the patronymic strongly suggests that it is a modern form. Even if the patronymic were a valid late period form, as submitted, this name would still be two steps from period practice. First, it mixes an Irish Gaelic given name with an Anglicized byname. Second, there is a more than 300 year gap between the late 12th-C date for the given name and the late period or modern spelling of the byname. There are two things that can be done to fix the name. Reaney and Wilson, A Dictionary of English Surnames s.n. Quine, lists Luke Mac Quyn in 1403. We have changed the name to Ailleann Mac Quyn in order to register it; the 1403 date for the byname eliminates (barely) the step for temporal disparity. However, the combination is highly unlikely, as the mid-12th C is the last example we have for the given name, while the Anglo-Normans (and therefore anglicization of Irish names) don't appear in Ireland until the 13th C. If the submitter is interested in an authentic, and much more likely form of this name, we suggest Aillean ingen Chuinn, a fully Middle Irish form of the name. The patronymic m. Cuinn is found in the 1079 in the Annals of Ulster. Berthelemy Bergeron. Name and device. Per pale azure and vert, on a pale invected between two shuttles palewise argent three clarions sable. Submitted as Bartelemy Bergeron, the submitter requested authenticity for 13th-15th C French. Several commenters questioned the i-y switch between the documented Bartelemi and the submitted Bartelemy. The cited source for the given name, Colm Dubh's "An Index to the Given Names in the 1292 Census of Paris", shows the names Bartelemi, Bertelemi, and Bertelemy. Given these three variants, Bartelemy should be an unremarkable late 13th C spelling. However, the byname is first documented in the 15th C (1468). Since we have no earlier examples of the byname, to make this name authentic we need to use a 15th C form of the given name. Aryhanwy merch Catmael, "French Names from Paris, 1421, 1423, & 1438" shows Berthelemy in 1421. We have changed the name to Berthelemy Bergeron to fufill his request for authenticity. If the submitter is interested in an authentic 13th C form of this name, we suggest Bartelemi le bergier; both elements are found in Colm Dubh's article. Catan ingen ui Chuinn. Name. Submitted as Catan inghean ui Cuinn, the submitter requested authenticity for 10th-12th C Irish. The byname mixes the Early Modern Irish feminine patronymic marker with a Middle Irish patronymic. We have changed the patronymic marker to the Middle Irish form, lenited the patronymic as required by Irish grammar, and registered this name as Catan ingen ui Chuinn to fulfill her request for authenticity. The submitter made an authenticity request which was not noted on the LoI. Note that all checkboxes on the forms must be summarized on the Letter of Intent. Items where the checkboxes are not fully summarized may be pended, while letters that consistently fail to summarize checkboxes may be rejected for not meeting the requirements laid out in the Administrative Handbook for Letters of Intent. Catan ingen ui Chuinn and Ailleann Mac Quyn. Joint badge. Per pale gules and azure, a dragon and a unicorn combatant and on a chief triangular argent a triquetra inverted vert. Coilean Mac Caiside. Device. Argent, a bat-winged cat statant contourny sable, winged azure, the body enflamed gules. Helena de Argentoune. Device. Per bend sable and gules, a simurgh volant bendwise Or. Malis der Totschläger. Name and device. Per pale Or and sable, a double-headed eagle gules and a bordure counterchanged. Submitted as Malise der Totschläger, the given name, Malise, was documented from Withycombe, The Oxford Dictionary of English Christian Names, as an Anglicization of the Gaelic name Mael Iosa. Withycombe is not a reliable source for non-English names or for anglicizations of Gaelic names. However, Black, The Surnames of Scotland s.n. Malise, has Malis or Malisius in 1190 and 1210. The name is also listed in Reaney and Wilson, A Dictionary of English Surnames around the same time. We have changed the name to Malis der Totschläger to match the documentation. This makes the name a combination of English or proto-Scots and German, which is one step from period practice. The byname, Totschläger, was documented only from a modern German-English dictionary in which the word is defined as "manslaughterer." Several of the commenters questioned whether it was a period word, and questioned whether it was a reasonable byname. The word, with the meaning of "killer" or "murderer", is found in late period Bible translations and theological discussions. For instance, the word appears several times in Luther's translation of the Bible with the appropriate meaning. Given that the word with the desired meaning existed in at least late period, we must give it the same benefit of the doubt that we would give a late period English adjective as a descriptive byname: it is a straightforward descriptive word found in (late) period applied as a descriptive for a human; this makes it registerable. However, we have no evidence that this word was ever actually used as a descriptive byname, and we have scant evidence for similar constructions used as descriptive bynames. In Bahlow/Gentry, German Names we find several compound bynames involving the element "tödt" (death) but only "Todenhaupt" (death's head) has the "tödt" element first; other compounds such as Hasentödter (hare-killer) and Hirschtödter (stag-killer) place the "tödt" element second. Also in Bahlow we find several compound bynames involving the element "schläger," striker: in these compounds the "strike" element comes first, as in "Schlagenhauf" (strike the army), "Schlawiedt" (strike far), and "Schladot" (strike dead). If the submitter is interested in an attested byname with a meaning similar to Totschläger, we suggest one of these attested forms. Marius Mac Conchobhair. Name change from Marius Conor. This name mixes English and Gaelic; this is one step from period practice. His old name, Marius Conor, is released. Tegan of Liskeard. Badge. (Fieldless) In pale a chameleon statant vert atop a heart gules. Aylwin Wyllowe. Badge. (Fieldless) Issuant from within an open chest sable, a demi-catamount contourny erminois. A competent heraldic artist would not recreate the emblazon from this blazon or any blazon we could devise, thus this must be returned under RfS VII.7.b. If the submitter wishes to resubmit an open chest drawn in this fashion (that is, with the lid vertical), it must be accompanied by period heraldic examples. Reina Vidales de Tarragonna. Name. This name combines a given name meaning "Queen" with a territorial byname; this violates RfS VI.1 which says "Names documented to have been used in period may be used, even if they were derived from titles, provided there is no suggestion of territorial claim or explicit assertion of rank" We would drop the locative byname, but the submitter will not accept major changes. Dana is the submitter's legal given name. Isibel sverðaspillir. Name change from Isabelle d'Avallon. Her old name, Isabelle d'Avallon, is retained as an alternate name. Iuliana Muñoz Maldonado de Castile. Name. This name mixes Spanish and French. This is one step from period practice. If the submitter is interested in a fully Spanish form of this name, we suggest Iuliana Muñoz Maldonado de Castilla. Katherine Scarlett Hawkins. Device. Gules, a mouse rampant contourny and on a chief argent three carracks contourny proper, sailed gules. Magnus av Nordensköld. Name (see RETURNS for device). Melissa the Poulteress. Name change from Gabrielle de Benon. Melissa is her legal given name. Her old name, Gabrielle de Benon, is released. Michael Hawkins of Portsmouth. Name. Orion Storm Bruin. Device. Per fess azure and vert, on a bend cotised between a bear passant and a heart Or four gouttes de sang. Please inform the submitter that the bend should be drawn wider. Róisi MacCracken. Device. Or semy of bees, two chevronels purpure. Ute Rogge av Nordensköld. Name and device. Per pale gules and argent, a mullet of six points counterchanged points enfiling three annulets braced two and one sable. Magnus av Nordensköld. Device. Vert, on a bend sinister between a double-turreted tower and two herring in pale, that in base inverted contourny, argent, four cauldrons palewise sable. This is returned for the use of an inverted, animate charge - the herring in base. In case I haven’t said it recently, and I probably haven’t (time just slips away, you know), that you, local heralds, heralds at large, and heraldic commenters from other kingdoms, who do a great deal of work with the submissions from this kingdom to make my task so much easier. You are very much appreciated by me, and by heraldic clients, who really don’t know how many folks contribute their time and knowledge in the submissions process. Best wishes for a happy holiday season (well, I missed the lymphad on that one), and even more best wishes for a happy, healthy and prosperous New Year.